After the Delaware and the Susquehanna, we found ourselves crossing the Cowpasture River and Salt Sulphur Springs, Clinch River and Bog Swan Creek, Poor Hollow, Rio Puerco, Cottonwood Wash and Moore Gulch. Though I probably dozed off and missed a few, and many remained unidentified by signs, by the end of the trip there were 113 on my list. If we couldn’t hear the sound of the water itself, the syllables of the names became a new way for me to chart this country. I thought of this list recently, and the curious way we have of naming the features and events of the natural world. Maybe it’s a result of extreme weather patterns, but meteorologists seem to have developed a mania for naming storms — it is no longer simply hurricanes to which we assign names, but snowstorms and even ferocious rainstorms. Winter 2017 wasn’t especially severe, but here in the Northeast the craze for naming gave us Niko, Orson, Pluto and Stella. As well as the promise by the Weather Channel to name a storm next year after Stephen Colbert after he questioned the logic of this practice. While it is hard not to admire the inventiveness of the meteorologists coming up with these names, it would likely be of greater benefit if we could find a similar pleasure in learning a few of the names that identify those features of the natural world we live with all the time. Which is to say, instead of making up new names, we might consider learning the names that already exist. Giving something a name is the first step in taking care of it. Place names help us to attach landscape to history and region. And when it comes to the question of attachment, we are not just speaking of how names are attached to places, but how humans become attached to places. In her recent biography of the poet Elizabeth Bishop, Megan Marshall quotes her late in her life: “I want now — now that it’s too late — to learn the name of everything.” And Bishop began to identify the names of Maine flowers: white clover, oxeye daisy, red clover, wild radish, beach pea, white rosa rugosa, fragrant bedstraw. I revisit more names on my own list: Caney Fork River, Chief Creek, Dry Creek, Live Oak Draw, Fish Wash, Puckett Draw, Brazos River, Deadman Wash. As our trip took us west, and as the streams and creeks became washes and gulches, rios and draws, these names confirmed the abiding connection between language and landscape. All are embedded in local history. 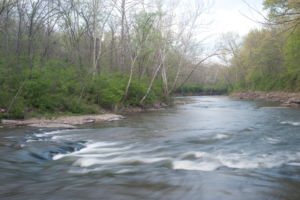 Fish Wash and Cowpasture River evoke particular purposes — where fish were once ample and where a herd of stolen cows was supposedly abandoned after they grew tired. Caney Fork River in Tennessee was named for the cane breaks — a thicket of grasses — found on its banks. The name of the Brazos River in Texas was derived from the Spanish Rio de los Brazos de Dios, meaning the “River of the Arms of God” — what the waterway appeared to be to early settlers in that parched part of the country. Other names likely evoke long gone residents, and if the facts of their lives are no longer known to us, conjecturing about them is almost as good. And Deadman Wash … well, I’m sure there’s a story there, too. Another poet, Mary Oliver, says that devotion begins with attention. And part of paying attention to things, it seems to me, is knowing their names. At a time when funding for the Environmental Protection Agency and scientific research are under such threat and the regulation of environmental standards so compromised, perhaps we could make the effort to learn as many of the names of those places — and the trees, the rivers, the ranges, all the species that live there — as possible, before it’s too late.